Arkansas County's second courthouse completed in 1862. Shortly after the town of DeWitt was named in 1853, a temporary courthouse was constructed one block south of the public square, which was reserved for a permanent courthouse. 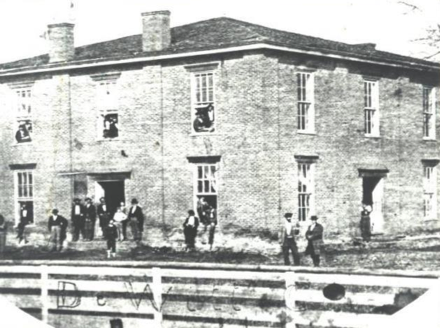 The first courthouse really consisted of three log buildings—one for a courtroom, one for the Clerk’s and Sheriff’s offices, and one for a Jury room. Arkansas County’s second courthouse was completed in 1862 on the public square. It was a handsome two-story brick building. After the arrival of the railroad in 1891, a building boom ensued leading to the construction of a third courthouse on the same site as the former building in 1893. It was a beautiful Romanesque-style building with three different shaped towers. However, the construction of the 1893 courthouse proved faulty, as cracks developed in the foundation and the building was condemned. This situation led to the construction of the fourth and current courthouse in 1931-32. It was designed by Little Rock architect H. Ray Burks and erected by the E. V. Bird Construction Company. It is one of the best examples of an Art Deco-style courthouse in the entire state. Art Deco-style characteristics include its stepped front parapet and fluted pilasters, which provide a vertical emphasis; the overall block-like massing of the building; and the elaborate floral and zig-zag patterns in the cast concrete panels around the building. Arkansas County has dual county seats—the county seat for the northern district was established in Stuttgart in 1913 as a result of the town’s pros- perity due to the rice-growing industry. The Arkansas County Courthouse, Northern District, also listed on the National Register, was built in 1928.